Transylvania Culinary Academy hasn't found a single, more apt, appropriate, and better word that encapsulates everything they offer you: to taste; to experience; to enjoy; to assimilate; to become part of; to take away with you; to leave you with. 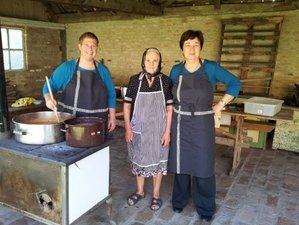 Join cooking vacations in Transylvania, a vast Romanian region which was part of the Austro-Hungarian Empire. Learn its traditional cooking and experience its distinct culture, a unique mixture of Saxon, Hungarian, and Romanian culture! The rooms are authentic in their details: old furniture and ancient traditional tools and objects that could be proudly exhibited in a museum and are there to give you the flavor of the past times. In the same time, each room offers space and comfort to satisfy your needs and allows you to relax and be on holiday. All rooms have a large double bed for two guests and private en-suite bathroom. An extra single bed or two can be added on request to most of the rooms. You will be assisted to accommodate in the location. Welcome beverage and light snack - local peasant dish. Guided visit of the village and the fortified church dating 1810 part of National Monuments Patrimony. Introduction and discussions on the workshop themes. Breakfast with natural products from local farmers. Visit to local market and free time in Sighisoara, the medieval citadel, UNESCO World Heritage Site. Lunch in Sighisoara at your own expense. 16:00 Cooking class. You start by picking fruits and vegetables from Transylvania Culinary Academy's own garden. Two traditional Transylvanian dishes will be prepared along with salads. 20:00 Dinner with prepared dishes; local brandy and wine included. After dinner, discussions and entertainment. Breakfast with natural products from the local farmers. Trip to one of the wineries in the region with tasting (transportation and fees not included). 16:00 Baking class. You will prepare one of the most popular pies in the Saxon tradition, as well as delicious cookies that used to be made in the preparations of the weddings. Drinks and dinner followed by entertainment with local traditional music. 10:00 Hands-on cooking class. You start with picking greens and vegetables from our own garden from which we will prepare specific seasonal dishes. A local village cook will cook with us a popular soup, specific for the region, but very easy to do it in your own home and adapt it to your taste. Free time in the afternoon. Many activities available will be presented, including visiting interesting historical monuments in the region, trip to Viscri, UNESCO World Heritage Site, including the shepherding experience, or cheese tasting. Participants will receive brochure with the dishes of the workshop. Changes will be made depending on the season, weather and availability of the activities. The Transylvanian region Transylvania Culinary Academy is located in, is called Tarnava Mare, and it is rich in natural produce: a large variety of organically grown vegetables; an extensive selection of meats; varied dairy products, specialty herbal and blossom honeys and good wine are all available. There are extensive forests where foraging can be enjoyed and you can collect wild herbs, forest berries and nuts, an assorted selection of wild edible plants and vegetables, as well as forest floor mushrooms and even truffles during the winter months. Transylvania is a great place for natural produce because it is an area of predominately volcanic soil, it will pretty much grow whatever you want it to grow. There are still bear and wolves in the area. Advice: Do not forage without a guide. The whole region is extensively protected in European Union law. Wild cherries, blackberries, raspberries, rhubarb and other orchard fruits are available in different seasons of the year. October is the time when Transylvania Culinary Academy makes their table wine from the vine in their courtyard. Late December is the time when the pigs are slaughtered and then prepared for eating in many traditional ways, to be enjoyed through Christmas, New Year's Eve, and New Year's day. Many smoked and marinated cold meat cuts together with sausages and a variety of traditional meat dishes can be enjoyed and you will additionally have the possibility of experiencing cooking together with local villagers. Put white cabbage pieces, dill, thyme, salt and black pepper with liter of water and let it simmer for some time till the cabbage is soft. Cut some bacon in small pieces and fry it in a pan. This will add an extra flavor to the soup. If you have smoked pork ribs you can put it to simmer with the cabbage from the beginning. When the bacon is fried, add two big onions finely chopped to fry with the bacon. Add tomato paste and 2 liters of water. Let it boil for 30 minutes. Make a light bechamel and add to it. Add salt and pepper to your taste. You can add sour cream when served. Bechamel: heat a pan and melt the butter. Add the flour and fry it till light brown. Take aside from heat, start pouring part of the milk till you have a thick paste. Add some more milk and stir continuously. Return to the heat and stir adding few tbs from the soup. Add all this to the soup. Visits to the historic fortified churches, towers, and their impressive views. Go cycling (bicycle rental is available in the area) or trekking through the beautiful surrounding countryside on the biking and trekking trails that connect to the villages close by. You can also go foraging and travel hunting in the surrounding area. Driving from Bucharest, you have around 240 kilometers to Crit. It is approximately 3.5 hours drive. Bucharest is located in the South of Romania and has one airport open at present: Henri Coanda International Airport - Otopeni (OTP). From Bucharest take the DN1 to Brasov. From Brasov drive for 84 kilometers on E60 (Targu Mures direction), and after passing Rupea and Bunesti village, turn left at the sign to Crit. Targu Mures is 86 kilometers from Crit and Transylvania Airport Targu Mures serves the area. Drive on E60 in the direction of Sighisoara and then Brasov. After passing Sighisoara following the signs for Brasov, and drive for approximately 29 kilometers and then turn right at the sign for Crit. Sibiu is one of the most important cities of Transylvania, and an European Cultural Capital from 2007. The Sibiu International Airport is an important access point for internal or foreign tourism. To reach Crit, you have to drive 130 kilometers on route 14 via Medias and Sighisoara. Follow the signs for Brasov for approximately 29 kilometers and then turn right at the sign for Crit. Culinary event creation and management in Romania, Europe. Cooking school in Romania, Transylvania. Cooking vacations Europe. This vacation requires a minimum of four participants.